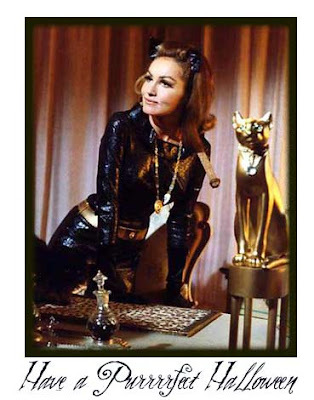 Julie Newmar, We Salute You! 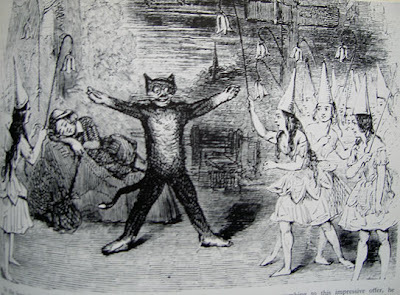 Have a Purrrrfect Halloween! Well folks, Cat Month has come to it's tail end...but every month is cat month in my heart! 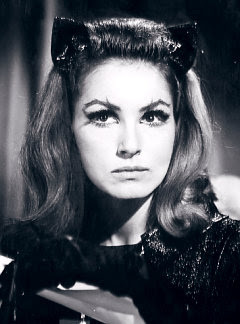 What a better way to celebrate Halloween than to honor the Original and quintessential (at least in my book) Cat Woman... the lovely and sublime Julie Newmar. Yes, she is by far my favorite Cat Woman (and hubby's too, LOL). When Batman reruns were being aired on our local network, we were psyched. Especially when it was a Cat Woman episode. She was Batman's one true love after all! 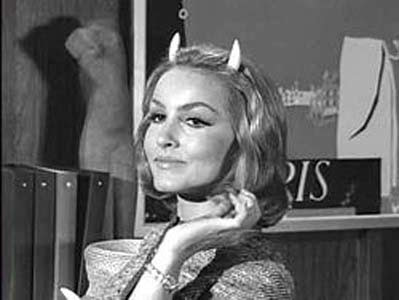 I happen chanced upon Julie in a 1963 pre-Cat Woman role as the devine "Miss Devlin" in The Twilight Zone episode “Of Late I Think of Cliffordville”. A must see, if you can Netflix or YouTube it. We were on a Julie Newmar kick after that, and watched DVD's of anything she was in. It's clear she was born to wear those headbands with little cat ears, or devil horns! 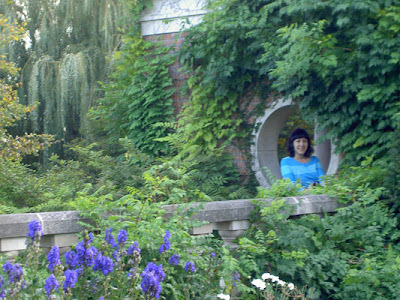 Newmar also is an avid gardener and even has a rose named after her. 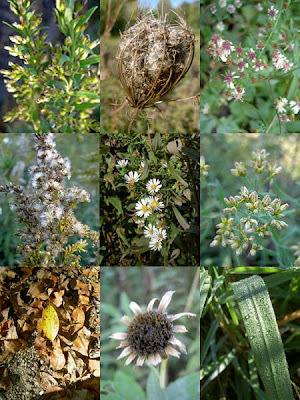 She has pix of her gorgeous lush California garden on her web site. Gotta see it. Thanks Julie, for defining the cat suit and your unmistakable cattitude! And to the Cats, and Cat lovers everywhere, we salute you with paws n' claws! Hello! We are looking for loving homes.. possibly yours? See us at peng-peng.com. Looking for something sweet, totally sugar free and zero calories this Halloween season? Well, Good News! I'll be updating my web site this Wednesday, October 29th at 12 noon Central (that's 10am Pacific/ 11am Mountain/ 1pm Eastern). I'm really loving this group of plump, smiley Buddha bears and sweet teeny kitties! 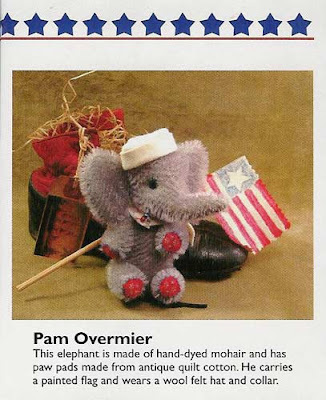 Oh, there may be one elephant too, if there's time! 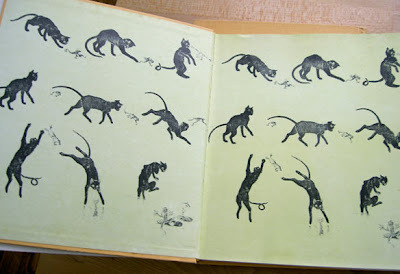 October is Cat Month, and we are ending it with a bang, ahem... a miaow! "Well good morning, bright eyes! Would you like a morning snack? 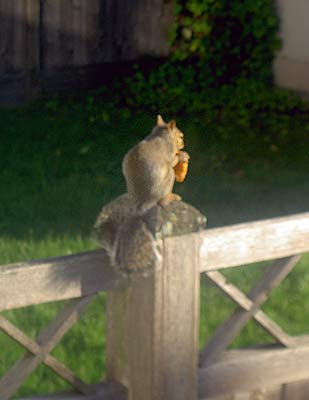 Oh, you're just too cute sunning yourself there on the fence post. Don't mind me, I'm just the weird human behind the window." Gee, does it sound like I have empty nest syndrome or what? I've created a new nickname for myself; the crazy-cat-lady-who-doesn't-have-cats. Wonder if I'm the only one? Pengy Press in new Teddy Bear & Friends! 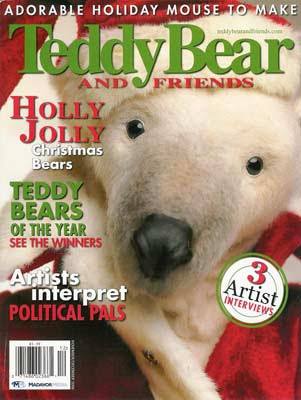 Hot off the presses: The new Christmas issue of Teddy Bear & Friends! 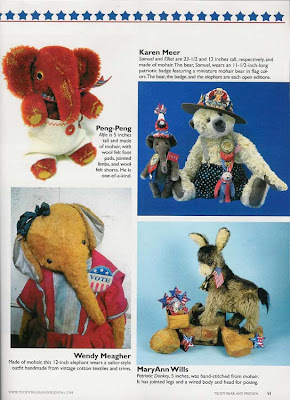 Take a peek inside to find one of my creations, "Alfie" the little elephant (named after the famous Alfonzo teddy known for his iconic red mohair with gold backing, who resides at Witneys). Some other talented artists featured: Wendy Meagher, Mary Ann Willis, Karen Meer... Oh, and my buddy... Pam! OMG! How cute are these? 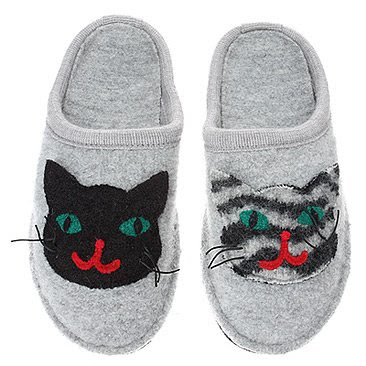 I came across these Haflinger Cats Slippers on-line today. They look so toasty. I am in desperate need of good quality slippers and my criteria is: breathable, hard sole, good support, non-leather, machine washable. And kitty faces is a bonus! Too bad they don't have the hard sole though. I am determined not to suffer with cold feet this year, as I have a nearly unbreakable habit of wearing my summer sandals *with socks* (eeek!) through the cold months... until it's sandal season again! I know, bad fashion and very bad for the arches. Now you've all got a really funny image of me in your heads, the same one my husband sees every day, LOL! I try to dress better in public ;O) So this year I promised myself and my tortured feet some "real" shoes and slippers. After all, we only have one pair of feet! Hope your toes are toesty! And lucky you if you don't need warm slippers where you live~ can I come visit? 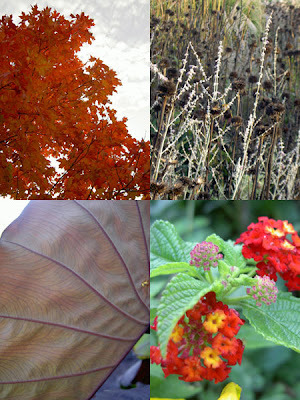 Celebrate NFCD today- October 16th and all year round. As I mentioned last month, I recently discovered a feral colony of cats living in the parking lot of a grocery store I frequent. This little fella, or gal (?) 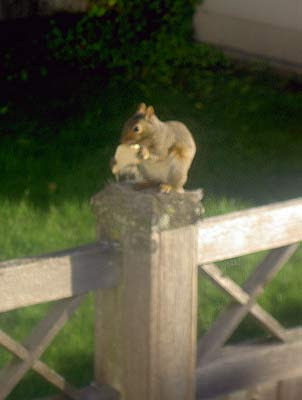 pictured above, I've dubbed Curly Tail. He was the first kitty I noticed.. well, hard not to, as he skampered in front of my truck as I was pulling out of a parking spot (then again, I seem to have an 'eye' for homeless furbeans)! I pulled over, and as I spoke softly to this kitty, 3 more gray kittens appeared from behind the milk crates... then a black one, then 2 or 3 torties...Oh my! A Colony! Here's a better pic of Curly Tail, who really stole my heart. 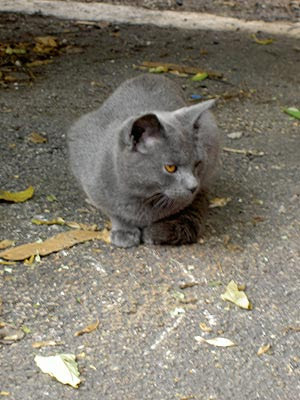 I did some research about curly tails in felines, and apparently this anomaly has been noted in gray cats. Or it may be due to inbreeding of colonies. These cats won't let you touch them, as they've never been socialized. I could not get these cats out of my head. 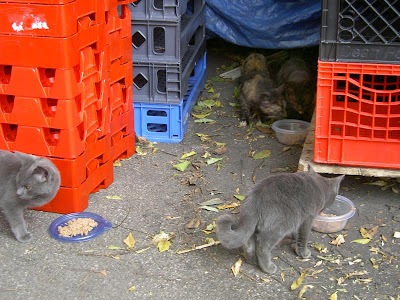 After Googling local animal-rescue/ stray cat sites, I located a Chicago feral cat group, who had coincidentally worked on a colony in the same exact location years prior. And good news! 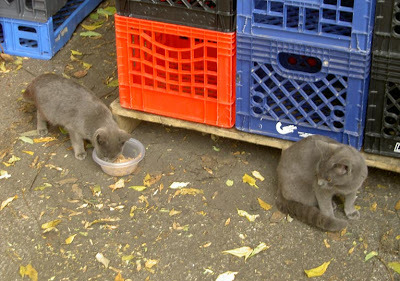 With their help these cats are now being TNR'd (trap-neuter-released) and will live healthier lives, without the burden of reproducing continuously, and causing literally thousands more cats (420,000 kittens in 7 years!) to be added to the overpopulation. 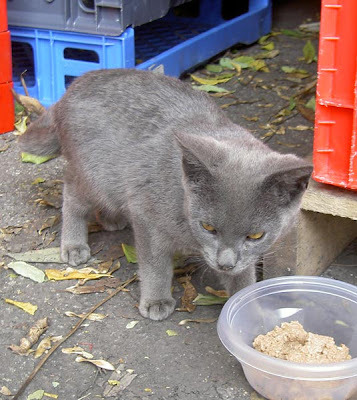 It's the most humane solution for ferals, who would otherwise be euthanized at pounds/ shelters. Alley Cat Allies, the leading advocate of TNR, is a great resource/ network to find others who can help. And guess what? Through Alley Cat Allies, I was able to find a no-kill animal shelter to TNR a cat colony living around my father's property in rural Pennsylvania! And I did it in just a single day, from my computer. Horrah! For the cats, and all homeless, unwanted animals...please spread the good word today- National Feral Cat day, and all year round: Spay and Neuter your pets! Together we can be part of the solution. 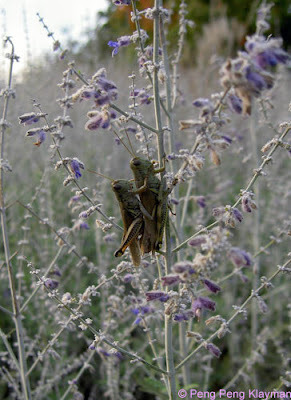 And here's my favorite pic of the trip~mating grasshoppers. 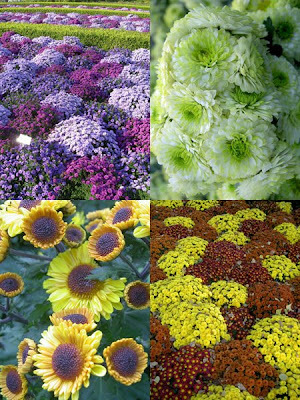 Love blooms anytime of year! Some things we just take for granted. I was having quite the productive evening last night, sewing away in my studio, when the lights went out during the rain storm. Eee gads! Well, in any case, that meant taking a mandatory break and search out some candles. 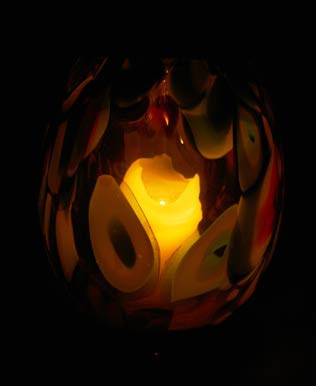 The beautiful, colorful Polish glass vase pictured above was a wedding gift. After a long while of not knowing how to display it (mainly from concerns of 3 cats knocking it over), it has found a wonderful purpose as a kaleidescope-ish pillar candle holder. I just put some sand in the base to keep the candle steady and to collect any wax. 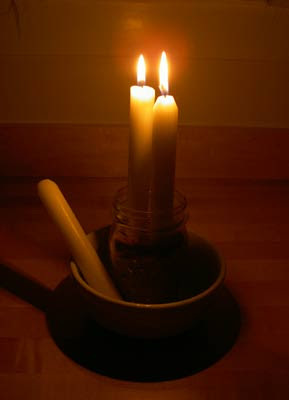 Electrical blackouts I find to be relaxing in a way, 'cos there really isn't anything to do except sit by the candlelight. And for those few times the when all bulbs are extinguished, TVs and computers off, the hum of all electrical appliances silent, and the streets are dark~ one can finally experience the night for what it truly is. Devoid of modern distractions. 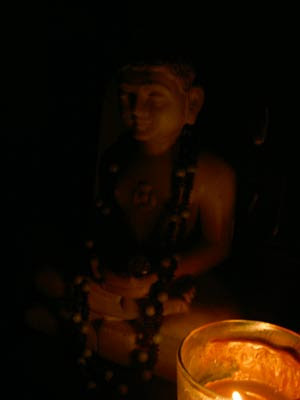 BTW, the candle next to Buddha is a delish Pacifica "Mexican Cocoa" soy candle. One of my favorite scents. It always impresses me how much can be illuminated by a single candle stick! I lit 2 candles in the kitchen and the glow was plenty for getting drinks and snacks. It was so practical that hubby and I will be doing this more routinely in the evenings to save power. 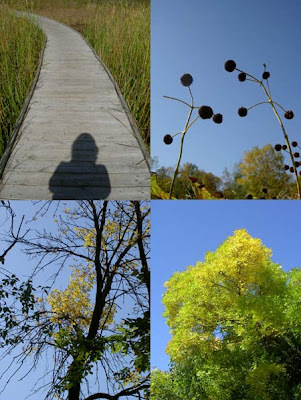 A few months ago, Rob and I were taking an evening walk through a lovely nearby wooded neighborhood. It was that magic hour at dusk when the deer, raccoon, owls and bats start to stir. 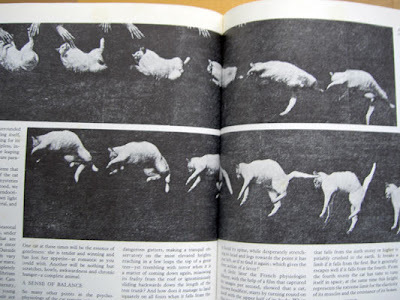 Out of a yard came dashing a black and white cat. We were both still experiencing cat-withdrawal from losing our Rosa about a month prior (but it felt much longer). So when we saw the black and white cat we enthusiastically called to it, "kitty, kitty!". Clearly a friendly cat, he affectionately rubbed against our legs and let us stroke his fur. Oh, it felt so comforting and familiar to pet his warm soft fur. As we continued walking, Rob commented that this was the first cat we have touched since Rosa. And I realized, wow, it had been a while. 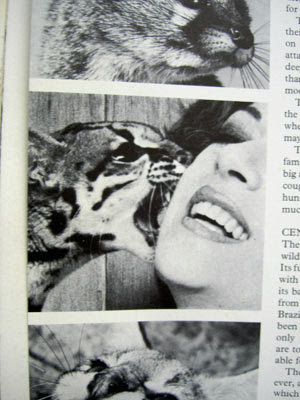 So thank you, black and white cat, for saying 'hello' to us when we really needed it. 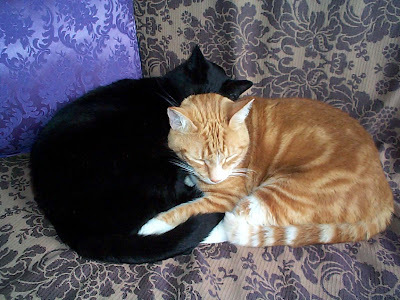 In lieu of the new black n' white cats I'm sewing, here is a salute to the real two-toned kitties of the world ~my inspiration. 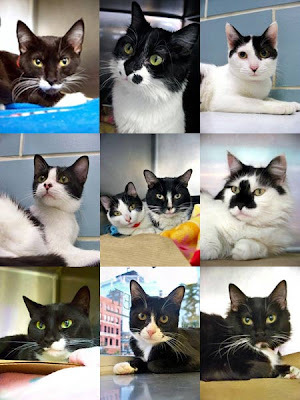 These cookies n' cream felines are currently looking for forever homes via Chicago's Anti-Cruelty Society. Oh, how I would adopt them all (or at least one!) but the time just isn't right, as Rob and I still have lots to renovate in our house and at the moment it feels quite barren (and kitties need nooks and levels and cozy places). 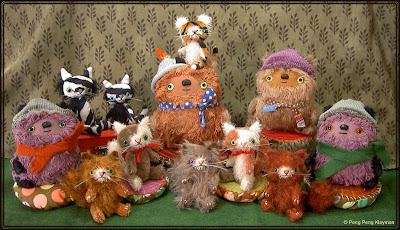 I hope by spring our house will be cat-ready, with scratching posts, window perches, and a little cat-sized doorway leading to the litter box ;O) It's something we work towards, with a place in our hearts for the next feline family member(s). Okay, even though October is technically Cat Month here, I must share with you this surprise that just arrived in the mail. 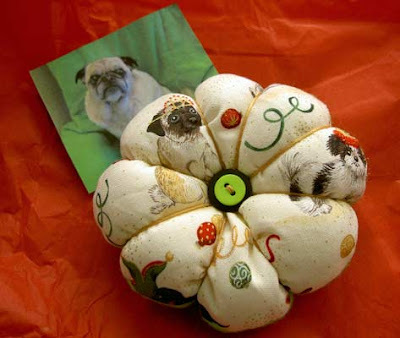 It's from sweet Melissa of Pug Notes. She made this adorable "Pug Cushion", as it be, for my sewing table. And that's a little pic of her famously fun Pug (that's Pug with a capital P!) Emmitt~ since she couldn't send him in the mail for me to hug, I guess that will have to do ;o) Thanks girl! Visiting my grandparents as a little girl would entail perusing the numerous volumes of old books in their cozy den. How my younger brother and I loved the den. Half of it was shelves of books, and the other wall hung with fine art prints from the likes of Dutch masters and Impressionists. I would gaze upon those art prints frequently. Grandpa would merrily hum a tune, while "two-finger" typing on his manual typewriter atop an industrial office desk. Grandma would sing along softly to the portable radio in the kitchen, always making something yummy. My brother and I were very content browsing the books, asking tons of questions, and I would also busy myself by drawing. Looking back, I am grateful for the enrichment my grandparents provided us~ for the Arts, and life. It helped shape who I am today. 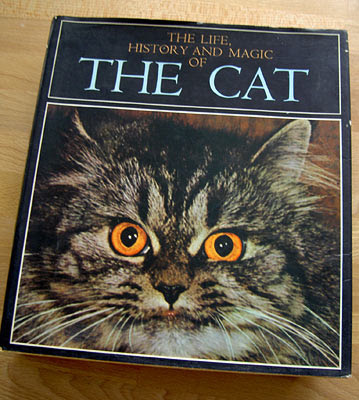 On the den shelf, one book in particular always drew my curiosity and attention: "The Life, History and Magic of The Cat" (1966) by Fernand Mery, a French veterinarian. 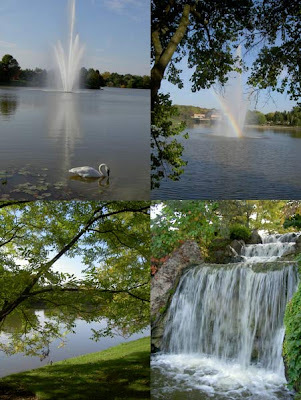 It is a large hardback coffee table book, lavishly illustrated and well edited. It is the the only book from my grandparents collection in my possession. Coincidentally, this title is also in my vet's waiting room! 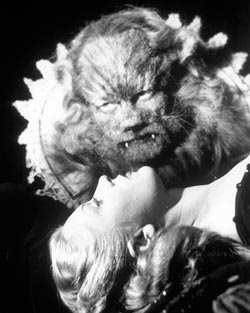 Kinda the same effect of Cocteau's "Beauty and the Beast", I saw it as a child and the imagery haunted me. As an adult, I now appreciate this beautiful film.